Mol. Cells. Mar 31, 2016; 39(3): 169-178. 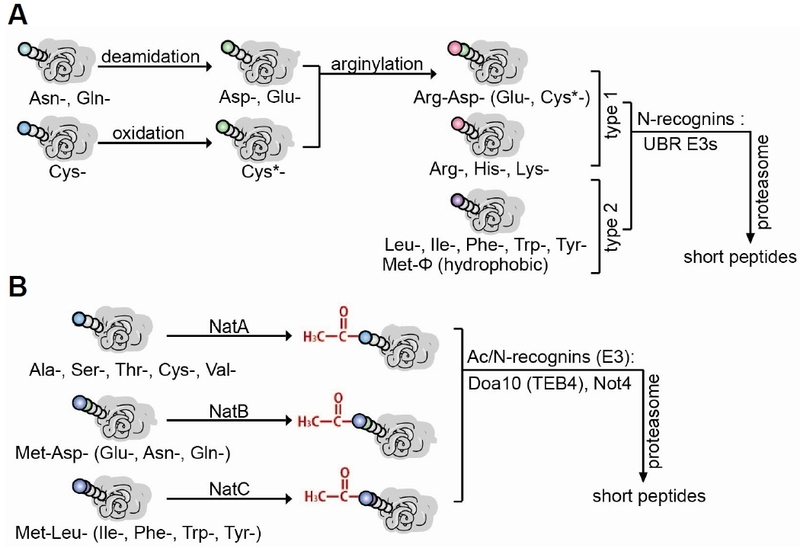 Nascent cellular proteins harbor Nt-methionine (Nt-Met), which is co-translationally removed by ribosome-bound Metaminopeptidases (MetAPs) if small residues (Ala, Gly, Ser, Cys, Thr, Pro, or Val) are positioned at the penultimate site. Nt-Met removal is evolutionarily conserved and occurs in approximately two-thirds of cellular proteins (Giglione et al., 2015). In eukaryotes, both retained Nt-Met and newly exposed Nt-residues (immediately after Nt-Met removal or their proteolytic cleavage) are very frequently Nα-terminally acetylated (Nt-acetylated); Nt-acetylation occurs in 80–90% and 50–70% of cytosolic human and yeast proteins, respectively (Van Damme et al., 2012). Unlike the reversible Nɛ-acetylation/deacetylation, Nt-acetylation appears to be irreversible because no Nt-deacetylases have been identified to date (Starheim et al., 2012). Additionally, Nt-acetylation takes place both cotranslationally and posttranslationally in vivo (Gautschi et al., 2003). Ubiquitin (Ub) is a small 76-amino-acid protein that is highly conserved across all eukaryotes. Ubiquitylation links the carboxyl terminus of Gly in Ub to the Nɛ-group of Lys or, relatively rarely, to the Nα-amino group of Met in cellular proteins. The covalent linkage of Ub to target substrates requires consecutive reactions of Ub-activating enzymes (E1s), Ub-conjugating enzymes (E2s), and Ub ligases (E3s). The ubiquitylation reaction repeats several times to generate a polyubiquitylated substrate that is selectively eliminated by the 26S proteasome. In the UPS, E3 ligase directly contacts target substrates for polyubiquitylation and subsequent proteasomal degradation (Varshavsky, 2011; Zattas and Hochstrasser, 2015). One fundamental question related to the UPS is exactly what structural or sequence features within a target protein trigger its Ub-mediated destruction by the 26S proteasome; are there any specific degrons (Kim and Hwang, 2014; Ravid and Hochstrasser, 2008)? 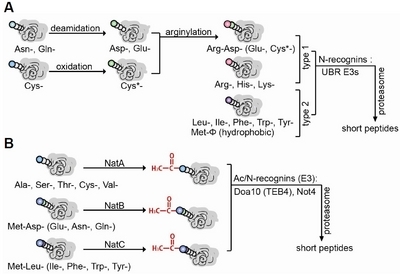 Khemlinskii and Knop showed that the degradation of a CL-mCherry-sfGFP fluorescent protein timer with Nt-Cys-Leu, a plausible Ac/N-degron, involves Doa10 E3 ligase and its cognate E2s Ubc6/Ubc7 (Khmelinskii and Knop, 2014). Fields and colleagues also demonstrated that chimeric fusions between Deg1 (1–67 residues of Matα2) and Leu2 are longer-lived when Asn at position 2 is replaced by a basic Lys or Arg (Kim et al., 2013), which suppresses Nt-acetylation in yeast (Arnesen et al., 2009). Additionally, Deg1-Leu2 becomes stabilized in an naa20Δ mutant that lacks a catalytic subunit of cognate NatB Nt-acetylase (Kim et al., 2013), similar to another Deg1-Ura3 reporter (Hwang et al., 2010a). However, Nt-acetylation slightly perturbs the proteolysis of different versions of Deg1-fusion and endogenous MATα2 (Zattas et al., 2013). Similar to Rgs2 variants in hypertension patients, 2nd-position mutations are observed in many proteins, particularly in cancer cell exomes (Kandoth et al., 2013). 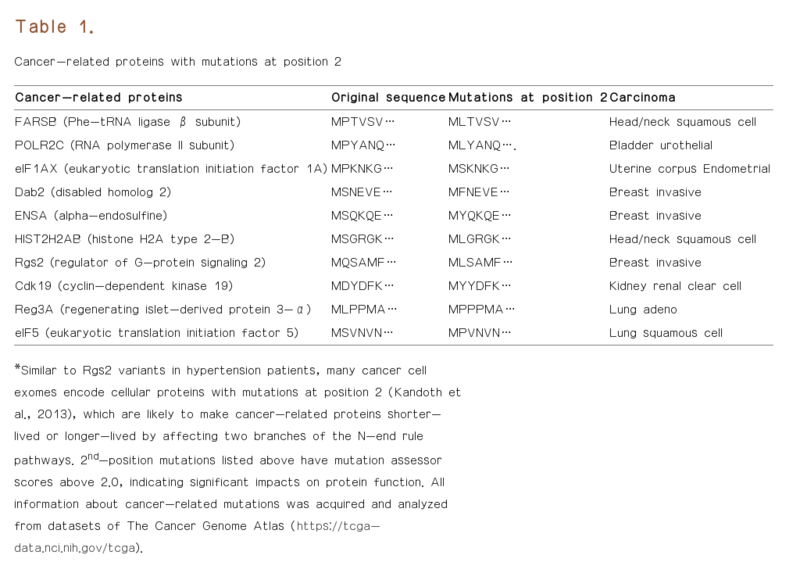 Some cancer-related proteins may become longer- or shorter-lived as a result of 2nd-position mutations, which cause their targeting to either the Arg/N-end rule pathway or the Ac/N-end rule pathway (Table 1) (Fig. 3C). For example, the tumor suppressor Dab2 (Disabled homolog 2), 80–90% of which is lost in ovarian and breast cancer cells (Bagadi et al., 2007), and ENSA (α-endosulfine), of which overexpression suppresses hepatic tumor growth (Chen et al., 2013), are expected to be short-lived due to their 2nd-position mutations in cancer cells. In contrast, Reg3A (regenerating islet-derived protein 3α), which accelerates pancreatic cancer cell growth (Liu et al., 2013), may be long-lived due to its 2nd-position mutation. Accordingly, it is unclear whether particular 2nd-position mutations contribute to the development of extant malignant phenotypes by faster or delayed degradation of specific proteins (Table 1). Mol. Cells.Mar 31, 2016; 39(3): 169-178. Received December 7, 2015; Accepted January 14, 2016. Substrate specificity and subunit compositions of Nt-acetylases. Among 6 Nt-acetylases (NatA-F), NatA, NatB, and NatC mainly Nt-acetylate cellular proteins. NatA consists of a catalytic subunit, Naa10, and an auxiliary subunit, Naa15, and acetylates Ser (S), Ala (A), Cys (C), Gly (G), Thr (T), or Val (V) N-termini of its substrates after Nt-Met removal by methionine aminopeptidases (MetAPs). 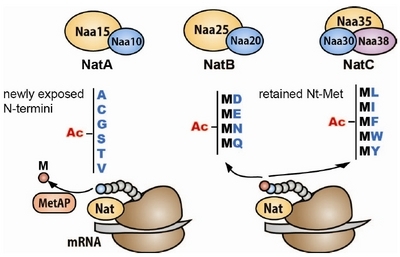 NatB consists of a catalytic subunit, Naa20, and an auxiliary subunit, Naa25, and Nt-acetylates Met-Asn (MN), Met-Asp (MD), Met-Gln (MQ), or Met-Glu (ME) on cellular proteins. NatC contains a catalytic subunit, Naa30, and auxiliary subunits, Naa35 and Naa38, and Nt-acetylates Met-Ile (MI), Met-Phe (MF), Met-Trp (MW), Met-Leu (ML), or Met-Tyr (MY) on its substrates. Two branches of the N-end rule pathways in eukaryotes. (A) The Arg/N-end rule pathway, which targets unmodified Arg, His, Lys, Leu, Ile, Phe, Trp, Tyr, and Met-Ф (hydrophobic) Nt-residues. Nt-Gln and Asn are destabilizing after Nt-deamidation and subsequent arginylation. Nt-Cys also becomes destabilizing through preliminary oxidation and subsequent Nt-arginylation. (B) The Ac/N-end rule pathway, which targets Nt-acetylated residues of cellular proteins for degradation. Doa10 and Not4 are yeast Ac/N-recognins and Teb4 is a mammalian Ac/N-recognin. In addition to the NatA, NatB, and NatC substrates, other Nt-acetylated proteins are potentially targeted by the Ac/N-end rule pathway for degradation. Functions of the Ac/N-end rule pathway. (A) Control of protein quality and subunit stoichiometry. The Ac/N-end rule pathway targets misfolded proteins or unassembled subunit(s) of complex proteins with Ac/N-degrons. (B) Regulation of blood pressure via G-protein signaling. 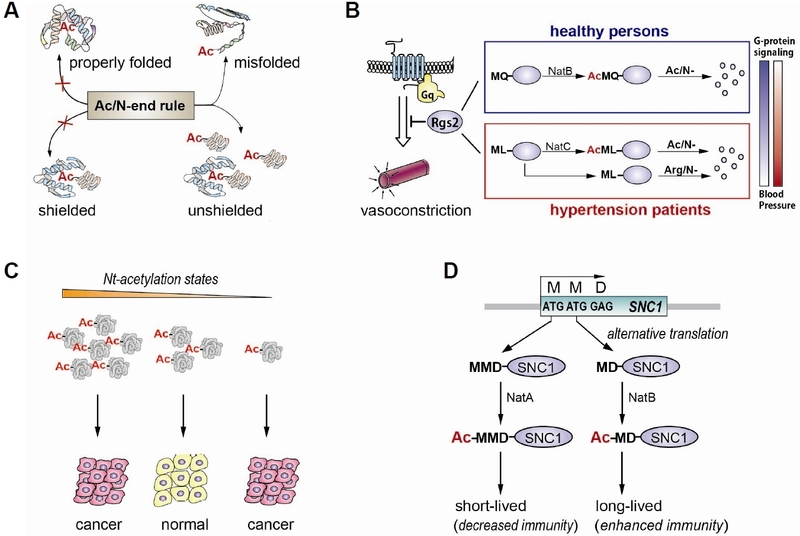 The Ac/N-end rule pathway degrades Nt-acetylated wild-type MQ-Rgs2. 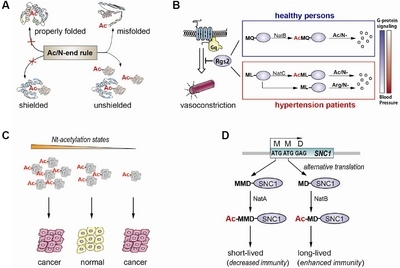 In contrast, the hypertension-related ML-Rgs2 with a Met-Ф degron is targeted by either the Ac/N-end rule pathway or the Arg/N-end rule pathway according to its Nt-acetylation status. Dual targeting of ML-Rgs2 by two branches of the N-end rule pathways dramatically decreases Rgs2 levels, and thereby increases blood pressure via augmented G-protein signaling and subsequent vasoconstriction. (C) Dysregulation of Nt-acetylation most likely affects protein stability, thus causing many cancers. (D) Control of pathogen immunity in plants. Plants contain two SNC1 (suppressors of nod-like protein receptor 1) variants with Met-Met-Asp (MMD) or Met-Asp (MD) N-termini owing to alternative translation. NatA Nt-acetylates MMD-SNC1 for degradation, whereas NatB Nt-acetylates MD-SNC1 for stabilization. Consequently, the steady-state levels of SNC1 are directly involved in plant immunity. *Similar to Rgs2 variants in hypertension patients, many cancer cell exomes encode cellular proteins with mutations at position 2 ( Kandoth et al., 2013), which are likely to make cancer-related proteins shorter-lived or longer-lived by affecting two branches of the N-end rule pathways. 2nd-position mutations listed above have mutation assessor scores above 2.0, indicating significant impacts on protein function. All information about cancer-related mutations was acquired and analyzed from datasets of The Cancer Genome Atlas (https://tcga-data.nci.nih.gov/tcga).